For many people, the Gap of Dunloe trip is the ultimate way to experience the best that Killarney has to offer. The continued popularity of the Killarney Day Trip, as it also known, is testament to the wonders you will witness en route. Travelling through the ice age carved valley of the Gap of Dunloe and returning through Killarney National Park via the three Lakes of Killarney, it a journey you will never forget. The spectacular scenery continually changes throughout the day and you will find it hard to pick your favourite part of this memorable trip. The memories of a trip through the Gap of Dunloe are formed by the huge variety of sights, sounds and scenery that make up the different parts of the day. As the day begins, there is a sense of excitement as you prepare to follow in the footsteps of thousands who have done this trip for hundreds of years. The views from the Head of the Gap as you look back towards Kate Kearney’s are hard to beat. Maybe only surpassed by the magnificent panoramic views that you are afforded when you see Killarney National Park from a boat. As you sit down for your well-deserved meal after a day in the Gap, you will think back to the vast expanses of the Black Valley. The feeling of the fresh lake air on your face or the cool surface of the lake on your fingertips as you ease away from the pier will linger long after you reach dry land and bid farewell to your boat’s driver. The Gap of Dunloe is situated approximately 12 km west of Killarney town and the famous day trip can be travelled in either direction. Either start your day on the boats to reach the Black Valley or else head off from Kate Kearney’s Cottage through the Gap and return to Killarney via the three lakes of Killarney. The direction of your journey is the first thing that you need to decide. After that, you have a number of options in terms of transport. Some of these are laid out in the table below. No matter what you decide to do, you are guaranteed a magical journey as you travel through some of the most spectacular areas of Killarney National Park. All-inclusive package tours are available for all four legs of the trip. This would include private transfers to Kate Kearney’s Cottage and pickup from Ross Castle. The Gap of Dunloe leg could be done in a jaunting car or by a pony ride. Boat trip is also included in the package. If you are using the shuttle bus or taxi to get to Kate Kearney’s Cottage, make sure to book your boat trip / pony ride or jaunting car in advance. If you are walking or cycling through the Gap, please ensure that you leave sufficient time to meet the boats at Lord Brandon’s Cottage. Aim for 1pm. Taxis are not available at Ross Castle. You will have to phone for one or pre book a collection. Check shuttle bus timetables in advance to make sure that they are available. Bring appropriate clothing for the trip. Weather can change quickly in the Gap and even on a sunny day, it can get a bit chilly on the open boats when crossing the lakes. Boats generally leave from Ross Castle in the morning (approx 10-10:30 am) and arrive at Lord Brandon’s Cottage about 60-90 mins later. The boats make the return journey from Lord Brandon’s to Ross Castle later in the afternoon. The boats depart Lord Brandon’s between 1 and 1:30pm. These times are indicative only. Please book in advance. The traditional starting place for the Gap of Dunloe trip is at Kate Kearney’s Cottage. You can reach Kate Kearney’s via private transfer, shuttle bus or taxi. From here you have a number of choices to make your way through the gap. The famous gap ponies will take you on horseback, you can go on a horse drawn jaunting car or make your own way on foot or on bicycle. All of these options will mean that you can return to Killarney via boat. In all cases, make sure that you book all of these in advance as you cannot be assured of having availability, especially in the summer months. If you are cycling, you may be able to bring your bicycles on the boat with you but please make sure you check this when you are booking the boat leg. Kate Kearney’s Cottage is about 20 minutes’ drive from Killarney. Walking from Kate Kearney’s through the Gap of Dunloe and Black Valley will take between 2 and 2.5 hrs. Travelling on horseback or by jaunting car will take considerably less. The boat trip through the three lakes of Killarney should take no more than 90 minutes in total. And off we go…whatever your mode of transport is, there is always a sense of excitement when departing from Kate Kearney’s Cottage. Leave the modern world behind you and begin your journey into the Gap of Dunloe. The road slowly rises into the gap at first before settling into a familiar undulating pattern. The Gap is guarded on both sides by the magnificent McGillycuddy Reeks mountain range. To the west is Ireland’s highest peak, Carrauntoohil. Soon will we arrive at the base of Strickeen mountain. Strickeen is a popular walking route that has a well-defined path that zig zags its way to the summit. On a clear day, the views from Strickeen are well worth the effort of climbing to the top. It is also the location for one of the many spectacular stages of the Killarney Adventure Race. Continuing through the gap, we meet one of the bridges that cross over the river Loe and the five lakes that it flows through. These glacial lakes are dotted throughout the Gap of Dunloe and the Black Valley. The formation of these ‘pater noster’ lakes are one of the many visible signs of Ice Age activity in the area. Watch out for great boulders perched precariously after being dropped unceremoniously as the glaciers melted. Abandonment from more recent times can be seen in some of the ruined homes from the Famine era. The rugged, remote nature of the Gap is a beautiful, scenic wonder but it must have been a difficult place to survive in famine ridden 19th century Ireland. As we approach the Head of the Gap, the road rises up steeply in a series of hairpin bends. If you’re using your own horse power, you’ll feel it on this stretch! The views back down the gap from here are magical so remember to look over your shoulder as you reach the top. Connectivity No mobile/cell reception in parts. The Head of the Gap marks the point where we begin the descent into the Black Valley. It is also a popular starting point for the climb of the Eastern McGillycuddy Reeks of Tomies and Purple Mountain. Ahead of you lies the great expanse of the Black Valley. Rising above you on either side are the slopes of the McGillycuddy Reeks. After heavy rain these slopes will be dotted with torrents of water cascading down into the valley beneath. Also visible on the slopes are the sheep that graze the area. If you are descending into the valley on a bicycle, watch out for sheep on the road on your way down. For those walking though the gap, this marks the end of the climbing for the day and where your knees must become accustomed to a new way of working! The Black Valley is a spectacular example of isolated natural beauty yet it is only a few miles from one of the most visited parts of Ireland. The towering peaks that surround it and the meandering roads that serve it mean that is still remains well off the beaten track to the present day. Famed for being one of the last places in Ireland to get connected to the national electricity grid in the 1970s, this splendid isolation makes this stretch of the trip extra special. Soon you will reach the base of the valley where the local church and hostel are located. Before this church was built, the residents of the valley walked the scenic but lengthy ‘mass path’ through Killarney National Park to Derrycunnihy Church. This section of the trail is part of the ‘Kerry Way’, a spectacular long-distance trail that winds its way around the Iveragh Peninsula. The road continues to descend and you will shortly arrive at a junction- keep left here to head for Lord Brandon’s Cottage. The road to the right continues along the valley floor and leads eventually to Moll’s Gap via a steep climb. Your arrival at Lord Brandon’s Cottage heralds the end of your journey through the Gap of Dunloe and the Black Valley. The arched gateway welcomes you across a bridge to begin your homeward journey through the three lakes of Killarney. As you bid farewell to your horses or disembark from your bicycle, take some time to explore the surrounds of the cottage. Lord Brandon’s was formerly used as a hunting lodge, today it contains a coffee shop and picnic area. It is here that many people take time to enjoy lunch or a snack before heading out on the Lakes for the next part of the journey. As you step into your open boat and slip on your life jacket, get ready to step into a wonderland. This boat trip is truly special and is one you will never forget. You will travel through all three of Killarney’s famous lakes and experience some spectacular scenery all through the journey. Seeing Killarney National Park from the boat is a completely different experience to that of what you have left behind in the Gap of Dunloe. Only the gentle hum of the boat’s engine and the lapping of the water against the boat intrude on the tranquility that is all around. From the water, you are surrounded by the magnificent beauty of Killarney National Park on all sides. The fresh lake air in your face is hard to beat. Starting on the Upper Lake, you will skirt around beneath the peaks of the McGillycuddy Reeks. The narrow channels of the upper lake are pockmarked with many islands, some of which are not much more than rocks protruding above the surface. The Eagle’s Nest mountain rises above you as you navigate the Long Range river towards the Meeting of the Waters. This stretch of the journey is probably your best chance of spotting one of the white tailed eagles that now inhabit the remote areas of Killarney National Park. As the Old Weir Bridge comes into view, this marks the arrival at the Meeting of the Waters. This is where the Upper Lakes flows into Muckross Lake and also into Lough Leane via a back channel. At this point, you may have to disembark and walk over the Old Weir Bridge to allow the boat to safely navigate through. Dinis cottage is located nearby and is a popular resting spot for those walking or cycling the Muckross and Dinis peninsula. Boats also regularly leave here to head for Muckross House and Gardens. As the boat carefully makes its way through the meeting of the waters. it joins Muckross Lake after passing under a footbridge. The middle of the three lakes is Muckross Lake. On its eastern shore is Muckross House and Traditional Farms. The lake is nestled beneath Torc mountain which rises up from the shoreline of Muckross Lake. On this trip, the journey through Muckross Lake is a brief one. (It is possible to divert and land at Muckross House but make sure you arrange this in advance). The next bridge that we will travel under is Brickeen Bridge that connects the Muckross and Dinis peninsulas. When the lake is low, this channel under the bridge can be quite shallow. In times before the Gap boats had engines, the oarsmen used a chain beside the bridge to guide the boats through by hand. The bridge is a beautiful viewing point on the Muckross and Dinis loop. 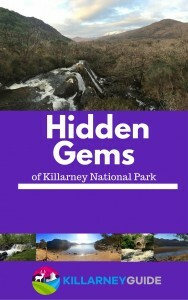 After leaving Brickeen Bridge you will be entering the third and largest of the three lakes of Killarney. The landscape and scenery now changes as we enter the open expanse of Lough Leane. The mountains of Tomies and the eastern Reeks that we passed in the Gap of Dunloe are now to our left as they slope down to the shorelines of the lake. Lough Leane is the largest of the three lakes of Killarney and you will see many of the famous sites of Killarney as you cross the lake towards our destination at Ross Castle. Away to your right is Castlelough Bay where the Lake Hotel can be seen on the shoreline. The Flesk river empties into Lough Leane at this point. The beautiful Glena bay area is off to your left. It was here that Queen Victoria stopped by for lunch during her visit in 1861. A fire destroyed the building during the 1920s but the ruins are still visible near the shoreline. Beyond Glena on our left are the slopes of Tomies mountain, home to marvelous native Irish oakwoods. Hidden in the woods is O’Sullivan’s Cascade which flows into the lake on the rocky shoreline. As you continue to cross Lough Leane, on your right you will see the Governor’s Rock, a viewing point on Ross Island. Ahead to the left is the lake’s largest island – Innisfallen Island. Home to a monastery in the 7th century, the island today houses the ruins of a more recent priory built in the 12th century. The island is accessible via a short boat trip from Ross Castle and is a magical place to spend some time away from the hustle and bustle of a busy world. On the low hills to the north of Lough Leane, you should be able to make out the Aghadoe Heights Hotel. Aghadoe is also home to another ancient monastery, Parkavonear Castle and some of the best views of the Killarney valley. As you pass Library Point on Ross Island to your right, you will soon be turning right into Ross bay and Ross Castle comes into view. It was from the lake that Cromwell’s forces eventually took the castle in the 17th century. Imagine artillery fire from boats on the lake pounding the castle as you sail peacefully into the bay. Today, a much more peaceful vista will greet you as you approach the pier at Ross Castle. The calmer waters of Ross bay provide shelter for the wildlife and also for recreational activities such as kayaking and rowing. The wonderful journey across Killarney’s three lakes has now come to an end. Take some time to explore Ross Castle and its surroundings. There are some beautiful trails on the nearby Ross Island or alternatively you can return to Killarney through the National Park at Knockreer. If you have booked a private transfer or taxi, you will be brought back to Killarney from Ross Castle. There are also regular scheduled bus operators that provide transfers from Ross Castle to Killarney town. If you are cycling or on foot, make sure you return to Killarney via the route through the National Park to finish off this spectacular day trip in style. It is with good reason that the Gap of Dunloe trip has prevailed for nearly 300 years. Not only has it survived, it has continued in a format not too dissimilar from its origins. The oarsmen have been replaced by outboard motors and some choose to cycle where horses still tread. In its essence, the trip remains largely as it always has been. To understand its enduring popularity is easy once you’ve taken the trip. It is spectacular and simple in equal measure. A walk, a pony ride and a boat trip – what could be more simple? Add in glacial valleys, mountain peaks and lakes and the simple becomes spectacular. If there is one thing that you have to do during a visit in Killarney, then surely this must be it. Enjoy. This is so informative. I have been searching all travel web pages to get a better understanding of the route, ways to get there, what the terrain is like and this site by far answers so many of those questions. Would be great if you could add the times the boats left and arrived and from where Ross Castle or Brandon’s Lodge. Thanks Sharon, glad you found it useful. I’ll try and update the article as you suggested. The boats leave at different times but they generally leave Ross Castle between 10 and 10:30 am and head to Lord Brandon’s Cottage. They then leave Lord Brandon’s between 1 and 1:30 and return to Ross Castle. I hope this helps. Drop me a line at hello@killarneyguide.ie if you need any more info. Brilliant article, had hopes to do the trip in September. Will definitely give it a go now that I’m so well informed. Thanks Donal. I am going to be traveling with 2 kids and 2 adults (65+) in my own car. Can I park at Kearney’s Cottage and then take some form of transport to and back to Kearney’s Cottage? Or can I just drive through the Gap myself in my car? Thanks for the very informative guide! thanks for visiting the site and the kind words, I’m glad you found the article useful. You can drive through the Gap of Dunloe but please be advised that it is a very narrow road that has only space for one car in many places. It has many twists and turns so caution is advised. However, it is a public road so you can drive it if you wish to do so. There is ample parking at the car park at Kate Kearney’s Cottage. You also have the option of taking a trip on the traditional horse and carts that depart from near Kate Kearney’s Cottage. I’m sure they would be open to taking you through the Gap to Lord Brandon’s Cottage and back again. Enjoy your trip to Gap of Dunloe! Thank you for the information. We are interested in hiking or biking the Gap of Dunloe. Can you provide information on this, like who to rent bikes from, how to reserve a boat ride, costs, distances, times, etc. Thank you. Thanks for leaving a comment. Please see links below for renting bikes and boat rides. The operators will advise on costs. There is a summary table in the Gap of Dunloe article above on the distances for each of the leg. The times/duration depends on whether you walk, cycle drive or get a jaunting car. Duration also depends on many factors. I hope the links below are useful. Lovely post, very informative and well written. Plan to do this hike tomorrow. Thank you! Thanks for the kind words Aundria, I’m glad you enjoyed the post. Best of luck with the walk tomorrow, you’re in for a treat!